With support from the Green Fund through the DBSA, Rhodes University plays a coordinating role in various projects and offers a platform for broader coordination through events, joint publications and this website. A key element of coordination is the expansion of thought leadership and the development of conceptual frameworks, overviews and systematic reviews. Another component of coordination is advocacy. The project lead inputs into the national skills planning system on behalf of the National Environmental Skills Planning Forum and advocacy initiatives with relevant authorities, such as StatsSA and the Labour Force Quarterly Surveys, to better count green occupations. 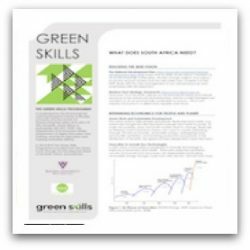 For an overview, see the Green Skills Project presentation. In April 2016 the Green Skills team members reported to all interested parties on the programme’s achievements in its first year, and hosted round table discussions on how stakeholders could participate in initiatives such as green skills research training, and the use of new tools and processes to determine employers’ green skills needs and the associated occupations. A skills framework in ‘the language of occupations’ was discussed as part of the New SETA Landscape Proposal.